Churchtown is a planned village and has a distinct “English” feel. Most Irish villages run along a main thoroughfare whereas Churchtown is built around a square or triangle. The village was rebuilt between 1822 and 1849 by Sir Edward Tierney who was agent for the Earl of Egmont. There are a lot of photographs here so downloading may take a little time but it will be worth it! refurbished for the enjoyment of guests in 1999. December 1820. The Market House is now the headquarters of the Windmill Nursing Home Group. 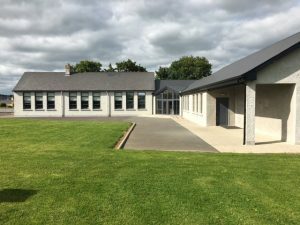 The multi-purpose community hall which was the original school in the village and opened in 1846 was also completely refurbised by the Churchtown DevelopmentAssociation in 1998 to 2000 when it was opened by President Mary McAleese on 14th July 2000. Click here to download a book entitled Our Heritage of Churches in Churchtown published on Thursday 24th August 2017. Education in Churchtown – Our Primary School was built in 1948 and the parish celebrated its 50th anniversary in 1998. What is now the community hall was the original school and the parish also celebrated 150 years of formal education in the parish in 1999 with the visit of Michael Martin TD, Minister for Education. The school principal is Donal O’Shea and he is supported by Angela O’Regan. Records from 1291 relating to our ancient graveyard and ruined church were set out in the Pipe Roll of Cloyne. Bruhenny Church was approximately sixty feet long and thirty feet wide. The nave of the church was in repair and the chancel in ruins in 1615 and the site was recorded as abandoned by 1694. The Church was officially closed in 1710 by an Act of Parliament which sanctioned a change to a new site. The majority of the headstones in Bruhenny village graveyard are located south of the Church with a number of flat slabs, table tombs and vaults dating from the 18th and 19th centuries within the area of the Church. On the 15th May 1999 parish resident and film star Oliver Reed was laid to rest in Bruhenny churchyard. May all who visit this sacred place remember those who have gone before. Ar dheis De go raibh an n-anam. setting our its significance at the Pound Corner. Burton Park the former home of the Ryan-Purcell family and before that the Earls of Egmont (Percival) is now the home of Slí Eile – a mental health charity. The original mansion which stood in Burton Park Demesne was built in 1676 by the Percival family. However, in 1690, along with much of Churchtown, the Burton Park House was plundered and burnt by the Duke of Berwick’s Jabobite forces retreating from the Battle of the Boyne. The house was subsequently rebuilt on a smaller scale. In 1889, Matthew John Purcell purchased Burton House and demesne from the Percival Family (Earl of Egmont) under the Land Acts. The Purcell’s had rented Burton Park since 1800. In the 1890s, through his agent Robert Sanders and in conjunction with the Board of Works, the Purcells embarked on imaginative (and expensive) alterations and improvements to the house and estate: bedroom floors were renewed, ceilings remoulded, chimney shafts rebuilt, a kitchen was added, pantries were provided, a porch built, slating and skylights were repaired and renewed, staircases removed or altered, and windows and shuttering replaced. Extensive work on the coach house, gate lodge, sheds and stables was also undertaken. Our Village Sports Field is located on Kerry lane just west of the village and has two playing pitches situated on a 10 acre site. The field is managed by the Gaels GAA who organise a wide range of teams at all levels playing Gaelic Football and Hurling. See also the new stand we are building. A standing stone which is clear evidence of settlement some 4,000 years ago is located on the old Boss Murphy homestead. by going north through George’s Street. 17th Century windmills in County Cork. The Equine sculpture commmemorating Vincent O’Brien with the Parson’s House. – O’Brien’s – can be seen in the background. The Churchtown Walking Loop Trails. organised by Noel Linehan. Thanks Noel. of a warm welcome, especially when you stay in Boss Murphy’s.